The clip, which was uploaded on Thursday night, a few hours after the Johor Ruler had dropped Tun Dr Mahathir to the airport in a first-generation Proton Saga, has almost 2k people reacting to it, with over 1,000 shares at the time of writing this story. 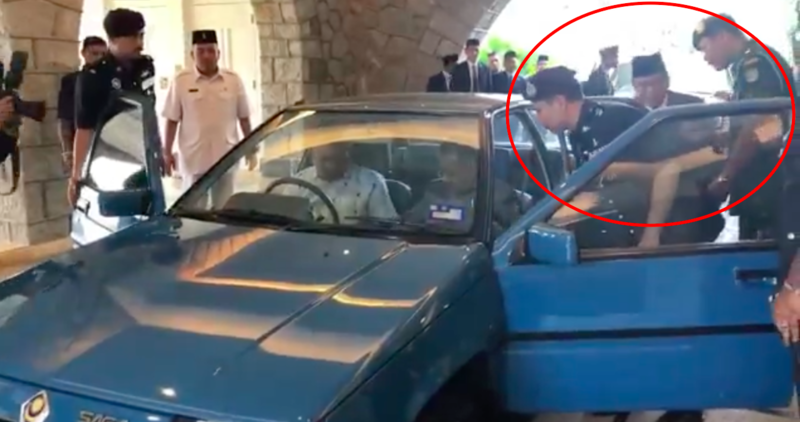 In the 31-second clip, the Johor MB is seen being stopped by who appears to be Sultan Ibrahim's military aide de camp from trying to get in the back seat of the Proton Saga. Osman can be seen opening the left passenger door at the 10-second mark. However, as he lowers his head to get inside the sky-blue Proton Saga, which was a gift from Tun Dr Mahathir to the Johor Ruler's father, the man in the military uniform can be seen putting his hand between Osman and the door to stop him from entering. According to him, he was not stopped from entering the Proton Saga as he was merely asking the Johor Ruler and Tun Dr Mahathir to be careful. In a now-deleted tweet, he claimed that certain quarters got jealous and created stories which are not true. Ex-CJ Who Alleged Tun M Was In Hurry To Be Sworn-In Now Says He "Made A Mistake Of Facts"
The ex-CJ was called out by the Prime Minister's office for his claims. It paves the way for Tengku Abdullah to be one of the candidates for Agong.